Telescopic Ladders Review – Watch Your Fingers! The amount of the roof rain gutter downspout maintenance depends mostly on the rain gutter maintenance and the downspout bottom end / its extension condition. There’s not much to worry about if you’re living in a tree-free neighborhood, where your rain gutter downspout will (in most cases) require no maintenance. However, every tree located close to your house will increase the chances of losing some of your valuable time on rain gutter downspout maintenance. The closer and taller the trees are, the more maintenance might be required. The simplest method to minimize rain gutter downspout maintenance and keep the gutter downspout interior clean is to install the rain gutter strainer. The gutter strainer will stop leafs and other debris from flowing into the downspout, and in some cases, contaminating it. You have to remember to clean the gutter strainer periodically (depending on the number of trees surrounding your house) to prevent it from blocking the water flow. Your rain gutter downspout should do OK without the gutter strainer if there are no trees in your area. 1. Observe your roof rain gutter downspout discharge while it’s raining. If there’s little or no water coming out the downspout bottom end – check the gutter outlet first (top of the downspout / at the rain gutter attachment point). If it’s contaminated – clean it and watch if that improves the water flow. 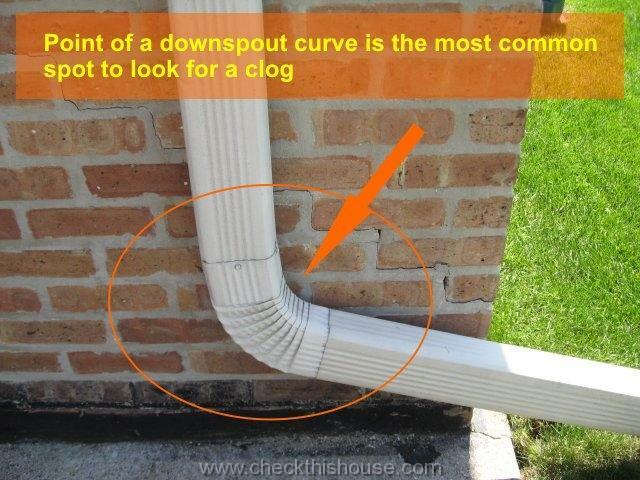 If your roof rain gutter is still full of water, the gutter outlet is clean, and not much is coming out of the downspout – start by checking the condition of the downspout bottom end (most likely at the point of a curve), and / or its extension (especially the flexible type). Be careful while doing it, though. If the bottom end is clogged, there might several gallons of water just waiting for you to open the clogged section. 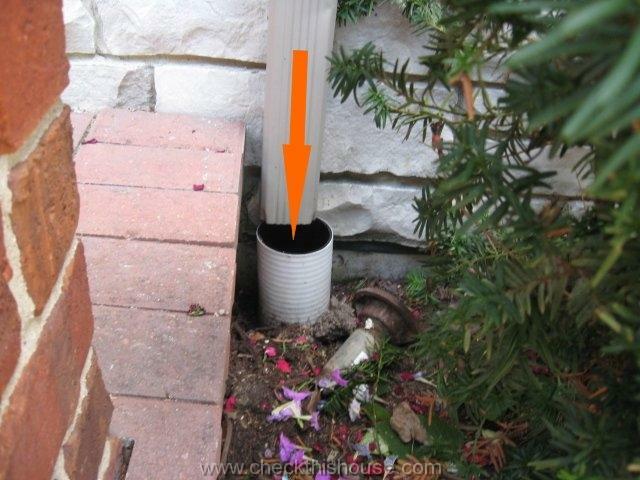 If the bottom appears clean and there’s no mechanical damage, you’ll have to work your way down the gutter downspout. 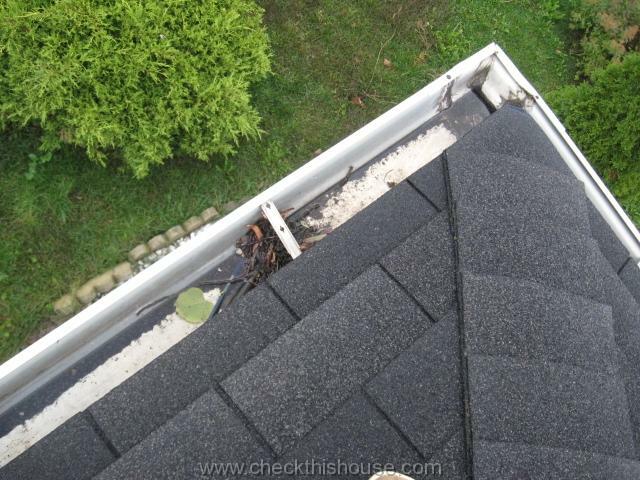 The clogging debris usually accumulates at the first or second point of curve, right below the soffit level. You can try to unclog the downspout with a plumbing snake by fishing it down through the rain gutter outlet. Anything long enough that is small in diameter, flexible, and strong enough to be pushed through a few downspout curves will work fine too. One of the examples would be an electrical “fish tape”, just be prepared for it to corrode, unless you happened to have a fiberglass type. 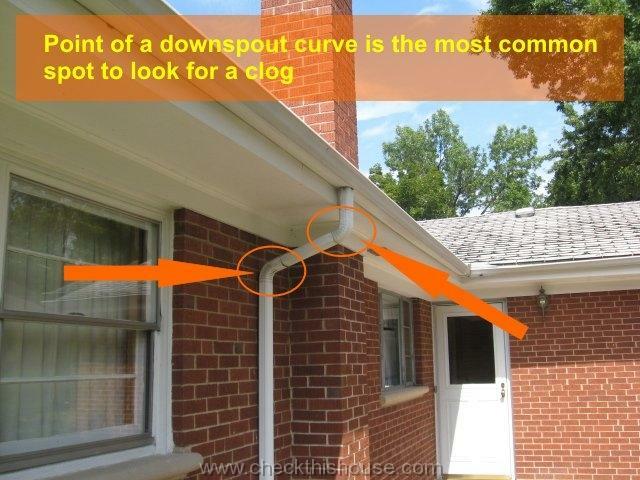 Continue your rain gutter downspout maintenance and keep turning / wiggling the snake line if it gets stuck on any of the curves or obstructions until you get through. Try to go in and out a few times to push down or break loose as much of the accumulated material as possible. The sound of the rushing water and a suddenly emptying rain gutter will confirm your success. If your roof rain gutter was empty, insert the garden hose into the downspout’s top opening and open the water valve – full blast. This should clear any remaining deposits from the clogged area. 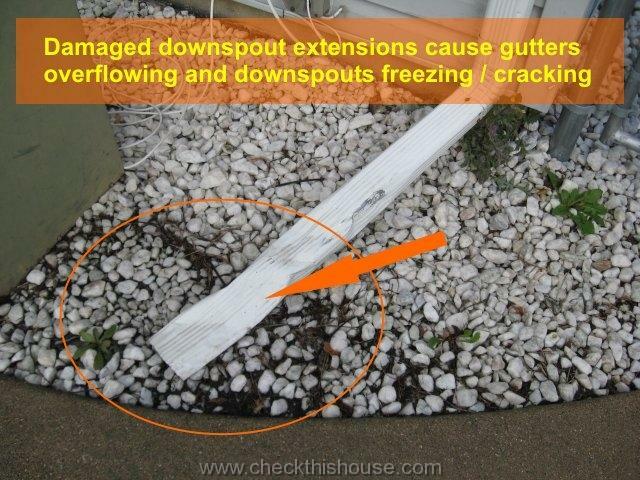 Clogged rain gutter downspouts, or their extensions, hold the water inside. The water freezes during the cold season and expands / cracks the seams open. When it gets warmer, the downspout spills water onto the wall behind the open seam, even after the clogging has been removed. Look between the gutter and the house wall to see if it is intact. 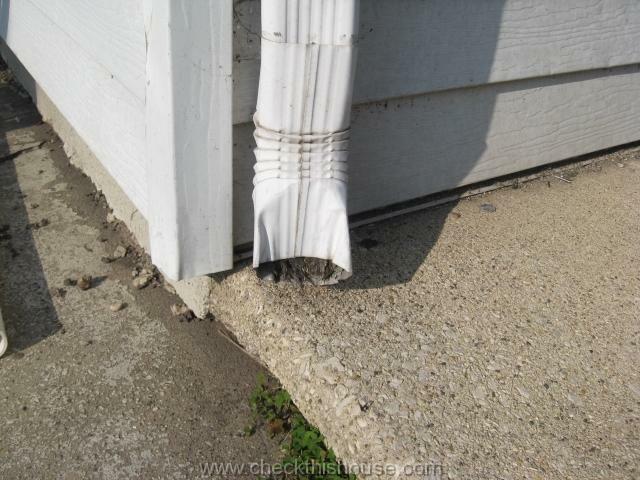 If the gutter downspout surface looks uneven – the seam is most likely broken. 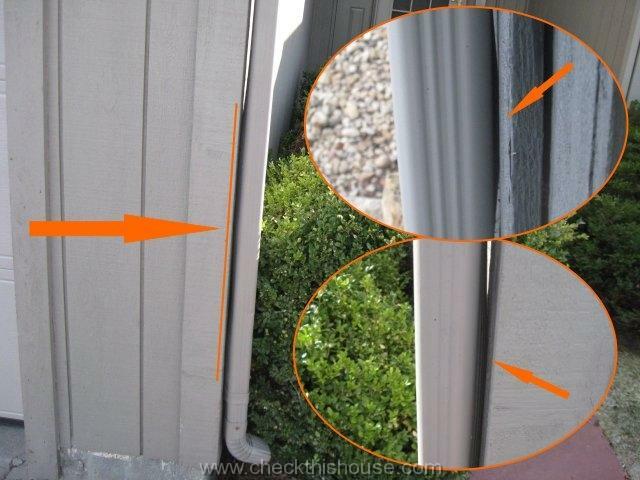 Other signs of the broken downspout seam might be a stain on the wall, deterioration of the house wall material, and/or interior wall damage in the area corresponding to the downspout. You can try to squeeze the gutter seam together – sometimes it will snap back in, sometimes you’ll need to replace this damaged section. Some jurisdictions do not allow underground drains anymore and require home owners to discharge rain water from their roof gutter downspouts onto the surface. Others may require to use those drains. If your gutter’s downspouts run into an underground drain, do not permanently secure that connection, allow for expansion and contraction during the cold season. Just make sure that the downspout section is slightly inserted into the underground drain opening to prevent water from splashing onto the wall finishes. 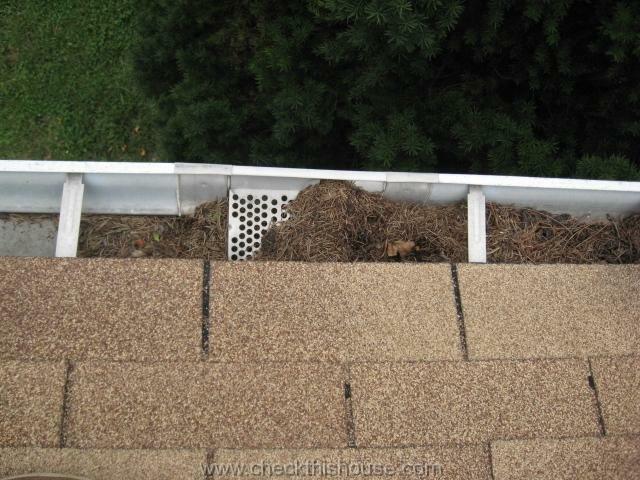 Also, install the gutter strainer to lower the amount of debris flowing into the drain. However, any sections of the extensions resting on the ground surface that are left attached to the rain gutter downspout for the cold season will most likely freeze up. The ice will eventually build back up to the downspout preventing drainage and causing downspout seams to crack – one of the reasons you need rain gutter downspout maintenance. 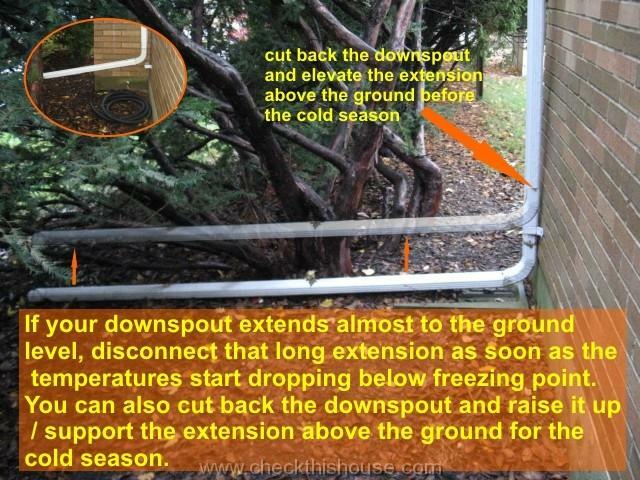 If your downspout extends almost to the ground level, disconnect that long extension as soon as the temperatures start dropping below freezing point. Also, make sure that the bottom discharge end is clean. Another option is to cut a section of the gutter downspout attached to the wall, so its extension starts higher above the ground. At the same time you also keep the extension suspended / supported above the ground level. For practical reasons / in some high traffic locations around your house, this rain gutter downspout extension setup may not be possible, but it is something to consider. Download our FREE 37 Page report - you could save $100's!